There are a number of ways that organizations, academic institutions, and service providers can become affiliated with HIGH FIVE®. We invite you to explore the various designations and contact us should you be interested in learning how HIGH FIVE can mesh with your organizational needs. We also encourage you to explore the benefits your organization can receive through registration. Our Info Package expands upon the holistic benefits of using HIGH FIVE to enhance your organizational objectives at all operational levels. 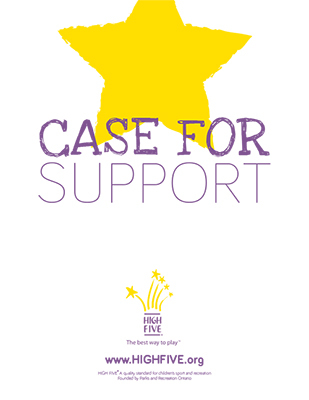 Need assistance making a strong case for your organization's involvement with HIGH FIVE? Our Case for Support gives you everything you need to clearly articulate the value of aligning with a national standard of quality in supporting your organizational objectives. Organizations involved in providing sport and recreation programs to children aged 6 to 12 can participate in the HIGH FIVE standard. By registering with the HIGH FIVE standard, an organization is declaring that it is committed to ensuring every child in its programs and facilities has a positive sport and recreation experience. Examples of Registered Organizations: municipalities, Boys and Girls Clubs, Girl Guides, YM/YWCA, private clubs, sports organizations. Who is my Authorized Provider? Questions not answered? Try our FAQ. After registration, organizations can then begin the process of accreditation. Launched in 2006, HIGH FIVE's accredited designation serves as the benchmark for excellence in children's recreation and sport programming. This is the standard for those organizations committed to focusing on healthy development of children and providing programs with the highest recognized levels of quality and safety. These provincial organizations endorse and promote the HIGH FIVE standard to their membership, clubs and stakeholders. Some organizations choose to provide incentives to their membership and clubs to become involved. HIGH FIVE® National and its Authorized Providers are committed to supporting the next generation of sport and recreation leaders. We believe that investing in students and preparing them for the workforce can help provide them with the tools and confidence to succeed -- and that's why we work with both secondary and post-secondary institutions to implement training and development programs. Universities/Colleges: Increasingly, employers in recreation and sport either require or prefer to hire applicants who hold the Principles of Healthy Child Development (PHCD) certification, and/or the QUEST 2 training. So HIGH FIVE is offered as part of the curriculum in a number of college and university programs. Colleges and Universities receive special training rates and are exempt from annual fees to enable more students to be trained in HIGH FIVE before they enter the workforce. Secondary/High School: Some schools implement HIGH FIVE training for their student leaders and advanced students during Professional Development Days. Some provinces also integrate the PHCD training into specific school courses. These organizations share a similar commitment to healthy child development as HIGH FIVE and host their own trainings for people working with children in programs. They recognize the value of creating positive experiences for children in programs and see the HIGH FIVE Principles of Healthy Child Development (PHCD) training as complimentary to theirs. The PHCD training for aquatic Instructors presents activities, lesson planning, decision making and conflict resolution sessions to reinforce the Principles to create a positive experience for children in the aquatic environment. The collaboration helps those in aquatics work toward creating efficient and effective ways to equip more employees with the benefits of PHCD training; a certification that is increasingly becoming a requirement for employment within many organizations. Affiliate Providers Include: Canadian Red Cross – Ontario Zone, and Lifesaving Society – Ontario. Interested in any of the designations? Would you like more information about what HIGH FIVE can mean for your organization? Contact your Authorized Provider today. If you are interested in becoming an Affiliate Provider, please contact HIGH FIVE National. [HIGH FIVE] has given staff insight into the role they play in creating positive memories for children.